Remember those we have lost to cancer . . . Honor those who have survived the battle . . .
Support those who are struggling today against this terrible disease. Memorials: Upon request, we will be glad to send a note that a donation has been made in memory of a loved one. Click here for more information. Dedications are posted here as soon as possible after receipt. Honor Board will be displayed in KCC Grill Room after April 15. Donations made after that date will be added as they come in. Click here for a form in PDF format. You will be directed to our page at the Community Foundation. After making your credit card donation, please send an email to Sally Hale so she can post your dedication. Cash, check and credit card donations are tax deductible. KCC charges are NOT tax deductible. These loved ones have been honored in 2017. In support of Kenmure Fights Cancer. David & Sue Amsler In support of Sandy Hastie. In support of Al Roberts. Ann Armstrong In memory of Gene Armstrong & Dave Allen. Gerry & Julie Ashbeck In support of Kenmure Fights Cancer. Jack Bahm In support of Kenmure Fights Cancer. Bob & Karen Balkman In memory of Mona Trogdon. In memory of Kathy Parr Hammond. In honor of Dirk Willms. In support of Sandy & Donna Hastie. Charles & Carrie Ball In support of Kenmure Fights Cancer. Mike & Barbara Beckerman In memory of Herb Notowich. Frank & Karen Beer In memory of Joanne Jones. Pat & Bob Bennett In honor of Helen Aschenbrener. Scott & Nancy Benyon In support of Kenmure Fights Cancer. Peter Benzing In memory of Eva Benzing. my husband and best friend. rest in peace loved ones. Connie Blanton In honor of Don Blanton. Robert Bonner In honor of Annette G. Bonner. Mardi & Ben Booker In memory of Roger Musgrove. Betty Brown In support of Cliff Brown, my loving husband. Don & Margaret Bryant In memory of Louise Bryant (1957). In memory of JoAnn Carter (1969). Pat Brydon In memory of Tom Brydon. Richard & Susan Bush In memory of Theresa Brown. Richard & Susan Bush In memory of Tony Hussey. Richard & Susan Bush In support of Sandy Hastie. Richard & Susan Bush In memory of Al Bacon. Ray died of inoperable glioblastoma of the brain. J. David & Lisa Caudle In memory of Lucille Everhart Williams. Barbara Clay In support of Kenmure Fights Cancer. Nancy & George Clement In support of Sandy Hastie. Beth & Jon Couch In honor of Kathy Newbold, Ken & Regina Hogue, and Sandy Hastie. Beth & Jon Couch In memory of Annette Rougeou. In support of Sandy Hastie. Pete & Debbie Dunderdale In support of Kenmure Fights Cancer. Rita Dunderdale & Jack Willobee. Tilden & Terri Edelstein In support of Kenmure Fights Cancer. Terri & Ashley Eisenhauer In support of Sydney Bailey. Ted & Carolyn Etherington In honor of All The Kenmure Cancer Survivors. Mike & Georgie Farmer In support of all those who work to cure cancer. John & Elizabeth Gould In honor of Diane Sheiry. In honor of Luanne Sheffield. Janet Greene In memory of Harold Ford Greene. Merrily & Richard Graber In support of Kenmure Fights Cancer. Betsy & Jim Gunn In memory of Tony Hussey. In support of Susan Bush. Susan Bush's work for Kenmure Fights Cancer campaign. Bill & Sally Hale In support of Kenmure Fights Cancer. Roger & Marian Hansen In memory of Carol Medinger. one out of a million with rare ACC. Donna Hastie & Daughters In honor of Sandy Hastie, a cancer fighter. 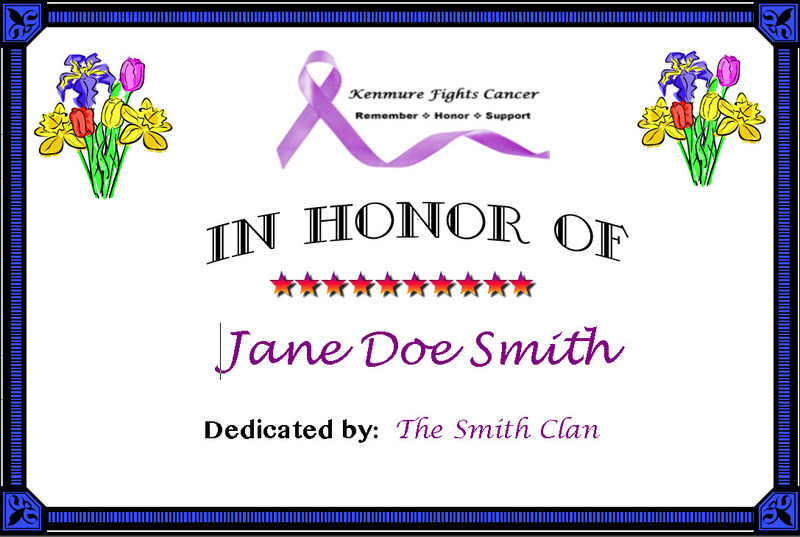 Sandy & Donna Hastie In honor of Susan Bush and her dedication to Kenmure Fights Cancer. Sandy & Donna Hastie In memory of Carol Medinger. Her Many Friends In memory of Joanne Jones. Don & Elaine Hessong In memory of family and friends. Kim Hinkelman In honor of Suzy Bond. Judith Hughs In memory of Bill Hughs. In memory of Nat Hughs. Dave Hussey In memory of Tony Hussey, my dad. 7 years old fighting leukemia. Donna & Fred Johnson In memory of Mona Trogdon and Benkt Berg. Karen Johnson In memory of Marcia Davidson, 1939 - 1973. Edie & Dan Lang In memory of Joe Bronitsky. David & Sharon Leiman In memory of those who have gone before. In honor of those caregivers who remain. Carol Lyons In memory of J. Austin Lyons. Bob & Elaine Mackay In memory of our parents. Doug Magnus In honor of Diane Magnus. Bonnie Manos In support of my friends fighting cancer. Ray & Ruth Mendrala In support of Kenmure Fights Cancer. my wonderful wife and best friend. Sandy Hastie, Al Roberts, Cliff Brown, Nancy Eskew, and Joyce Ann Millard. Tanna Cavella Johnson, Malachi Siltzer, and Mona Trogdon. Jackie & Tom Murrill In support of Kenmure Fights Cancer. Susan Oldham In memory of Richard Oldham. Bill & Judy Pendergast In memory of Mimi Pendergast Glogowski. Larry & Mary Jane Price In memory of Dr. Richard Oldham. Chip & Karen Pryde In memory of Marilu & Jerry Arciero. who were taken from us by this disease. David & Diane Quackenbush In memory of Inez & Doris, our mothers. Marilou Reed In support of Kenmure Fights Cancer. Karen Skelton In honor of Bill Skelton. Karen Skelton In honor of Katie Levesque, my hero. Linda Smith In memory of Benkt Berg. Robert Stone & Jan Hundhausen In support of Kenmure Fights Cancer. The Cats Without Hats In memory of Phil Bivens. The Snickers and their husbands In support of Al Roberts. 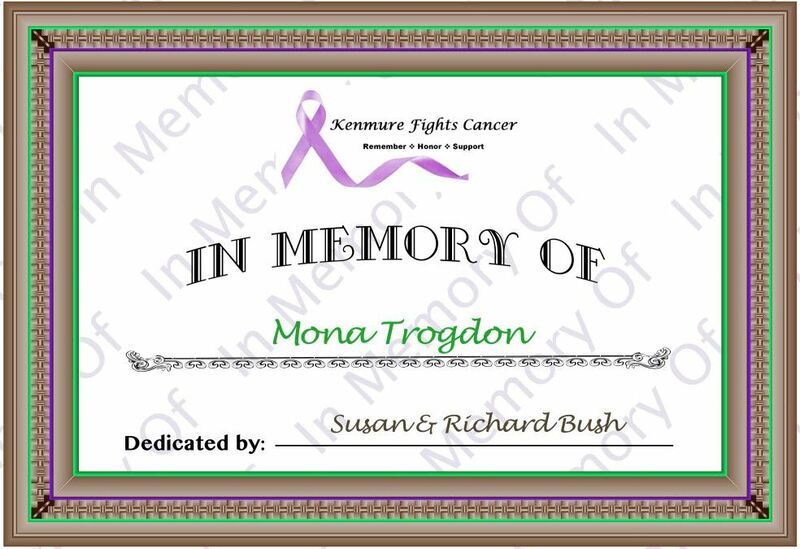 Harmon Trogdon In memory of Mona Trogdon. To My Lost Love forever remembered in my heart!! Bryan & Cynthia Vick In memory of Al & Olga. I am missing you everyday. Lavinia Zimmermann In memory of Chris Zimmermann.